However, after I ate my first one, I was in love! Easter cream eggs alone are amazing, but Easter cream eggs and fudge, well, they were just meant to be together…. 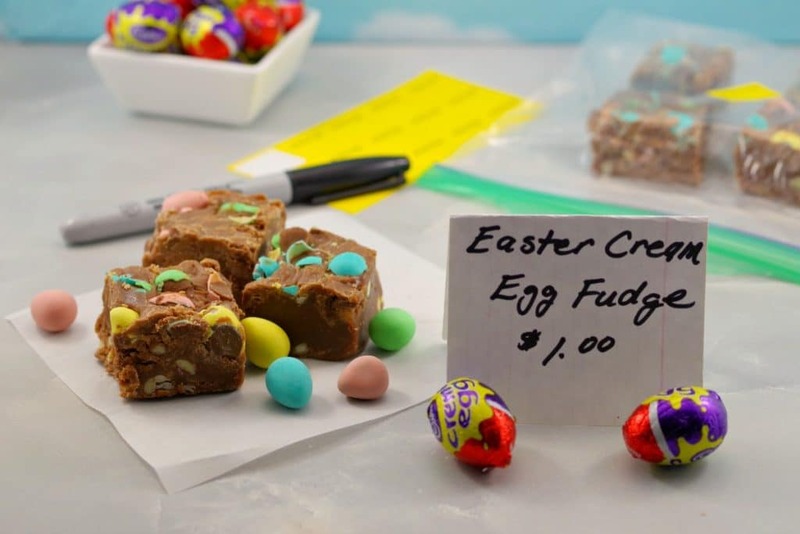 But add in the little colored mini eggs to the mix and not only do you have Easter Creme Egg Microwave Fudge, but you have yourself a total chocolate Easter egg party in your mouth! The Cadbury Easter Creme Egg has been around a very long time! Cadbury created the first chocolate egg filled with sugary treats in 1875 and in 1923 they created the very first chocolate eggs filled with cream. But Cadbury Creme Eggs as we know them today weren’t actually invented until 1963 under the name “Fry’s Creme Eggs.” The name changed to “Cadbury Creme Eggs” in 1971 . These cream filled eggs are produced by many companies around the world and it’s no surprise that Hersheys has the market rights in the United States. You can read more about this HERE. Although you can pretty much buy them anytime of the year nowadays, when I was a kid, when the Easter cream eggs came out, it meant not only Easter (which meant chocolate!) but more importantly, it meant that spring was on the horizon. You’d understand that spring was just as exciting as chocolate, if not more, if you grew up in Winnipeg and had just survived yet another Winnipeg winter! I’ve turned this recipe into a microwaveable recipe to make it faster and to avoid having to fuss with a candy thermometer, as many people aren’t fond of that process. And my aim is to make life easier for you! And this is one of the easiest fudge recipes out there. Kids love Easter creme eggs or any chocolate eggs any time of the year, so I made these for a spring bake sale and they went crazy for it! It was the first thing to go and I wished that I had made quadruple the amount I made. 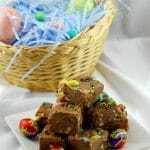 This Easter egg fudge also freezes well so you can make it well in advance! Just make sure you make 3-4 times more than you think you need because it will be a hot seller (especially if you put Easter cream eggs in front of it)! Bake sales are a great way to raise money! I’ve been involved with a few with my kids and the most recent raised $1200 for the Calgary Food Bank and their school programs! You can read more about that HERE. But even if you’re not having a bake sale or don’t like overly sweet treats, you’ll still love this quick and easy Easter Cream Egg Microwave Fudge (and so will anyone else you share it with)! Spray an 8 inch square baking pan with non-stick cooking spray. Place milk chocolate chips, white chocolate chips, sweetened condensed milk, and butter in a large microwave-safe bowl. Heat in the microwave on HALF POWER /50% (this is 5 on my microwave) for about 8 minutes, stirring every 1-2 minutes and more (every 30 seconds) towards the end/last 2 minutes. You want to heat it just until the chocolate mixture is melted and completely combined. 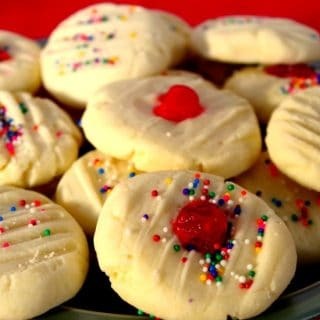 It may take up to 10 minutes, as the white chocolate chips tend to melt slower. Meanwhile, crush 12 mini Easter cream eggs. Transfer chocolate mixture to prepared dish and gently stir crushed mini Easter cream eggs into mixture. Sprinkle crushed mini eggs on top and gently press into fudge. Refrigerate until set and completely cool (about 90 minutes ) Slice into 25 (5 rows each way)squares and enjoy! **Note: This recipe freezes well for up to 3 months! This recipe is part ofThe Country Cook Weekend Potluck! I love that this recipe doesn’t need a candy thermometer! I can see how they’d disappear at a bake sale. Super cute! I totally remember growing up that creme eggs and mini eggs were around at Easter time and that was it. The same was true of so much of the Christmas chocolate you see all the time now. Year round availability kinda takes some of the excitement away. 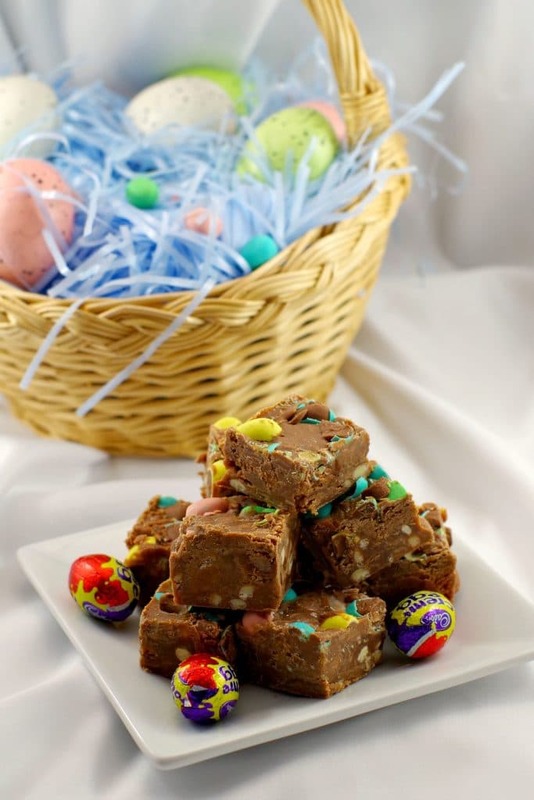 That being said, this fudge is super exciting and I know if I made it for Easter, my nephews would love it! Yum! (And thank you for not making me use a candy thermometer!) I love Easter cream eggs so much but this fudge is a much tidier way to enjoy them and such a quick easy recipe. Thanks so much! haha you’re welcome! Although I’m quite comfortable with a candy thermometer, this is so much less hassle! 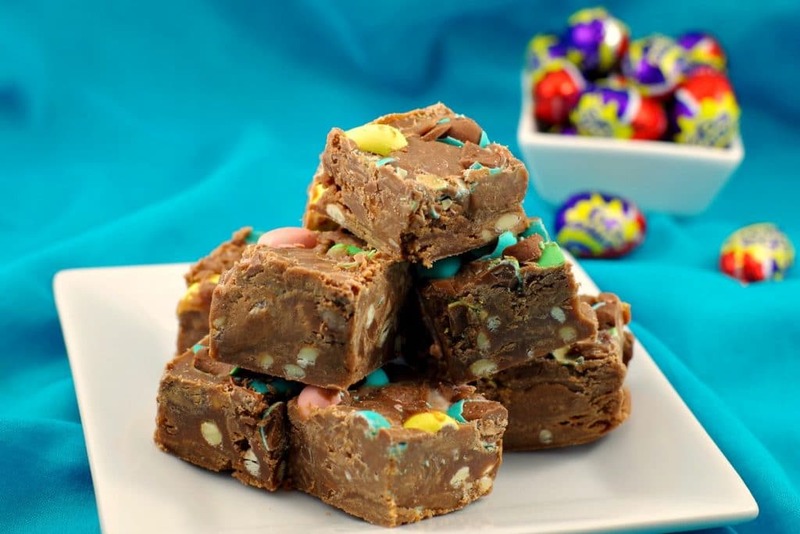 Creme eggs are my favourite Easter candy, and you’ve made them infinitely times yummier with this fudge!!! Looks so delicious I can’t wait to try it out! I can see why these are a hit! Who could resist? Also love the fact that is easy – I confess, I am intimidated by candy thermometers. Thanks, Kim 🙂 Candy thermometers can definitely be intimidating!